The training pitches next to the Ato Boldon Stadium, the site of the Home of Football. PHOTO COURTESY TTFA. THE TRINIDAD and Tobago Football Association (TTFA) has provided the nation with the current status regarding its Home of Football project in Balmain, Couva. In a media release yesterday, the TTFA spoke about the project, from its inception to its present state. However, the media release failed to state the cost of the project, the names of the project manager and contractor(s), the estimated time of completion, the financial input from both FIFA (the game’s governing body) and the TTFA, and the bidding process for contractors interested in the venture. “In August 2017 the Government of Trinidad and Tobago approved a long-awaited request, when it granted 7.64 hectors of land to the Trinidad and Tobago Football Association in order to establish a home for football,” the media release noted. 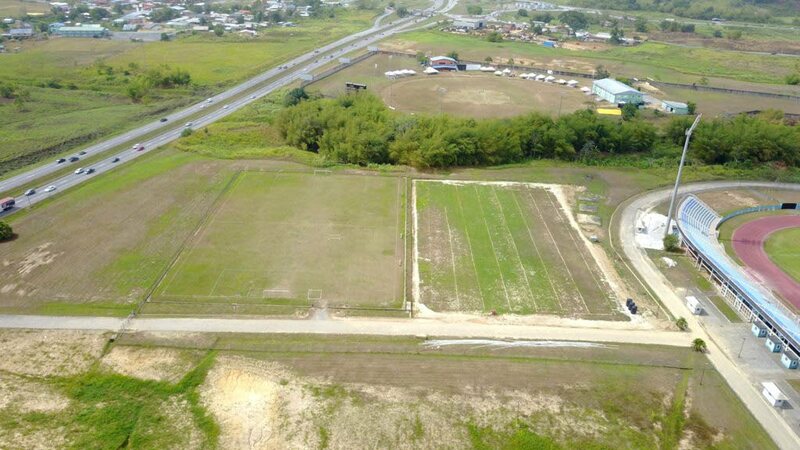 “The land is separated into three main parcels, one located in close proximity to the National Cycling Centre and two west of the Ato Boldon Stadium. The TTFA pointed out that plans for various aspects were approved “after countless brain storming and planning sessions”. Those plans were sent to Town and Country Planning for final approval on the building projects which finally came in February 2018. At the moment, two new training fields are 90 percent completed and the foundation has been laid for the Athletes Accommodation facility, according to the TTFA, while the “Income Generation Project” (which include, small goal pitches, the Beach Football pitch as well as the bar and recreational area) is at its halfway stage of completion. In related news, the TTFA will attempt, for the fifth time, to hold its Annual General Meeting (AGM) today, after numerous cancellations and abortions, at the National Cycling Centre. Hot on the agenda, once again, will be the TTFA’s 2016 financial statement and the progress of the Home of Football. Reply to "TTFA provides current status of Home of Football"